This post is sponsored by Soft Surroundings. All opinions are my own. This is my oasis. This feels so cozy and comfy to me. This is where I like to sit with a cup of tea and listen to a podcast or read a book. I love to curl up on my chair and shut my eyes. This is where I think and dream. So it’s important to me that it be beautiful. I believe we are happier if we live in a room we find beautiful. I don’t see interior decorating as trivial. It’s meaningful to the people that live in the space. Today I’m trying something new. If you are a regular reader of my blog, then you know my house is pretty neutral. But today I’m trying something new. I’m adding some pattern and color. I am curious to know if you like the changes. Let’s take a look. Here is what my bedroom normally looks like. 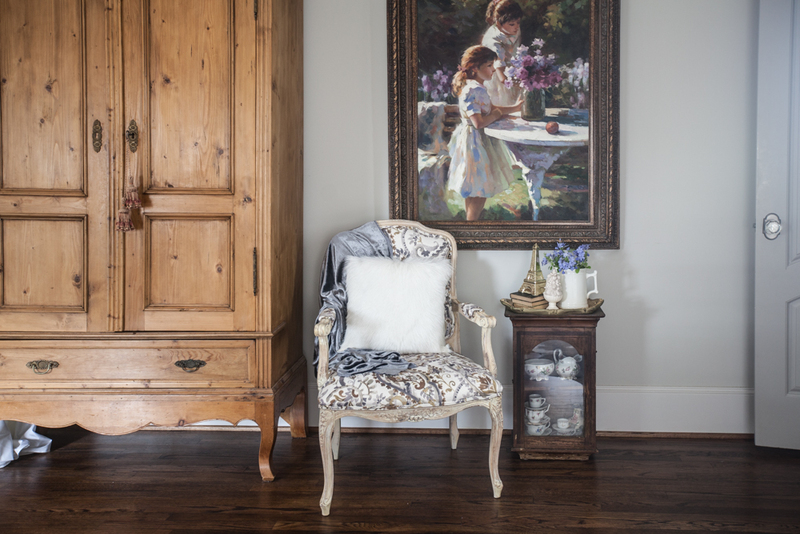 On this end of the room I had two vintage chairs that were a bit smallish. I loved the way it looked before, but let’s see how it can look with a bit of color and pattern. Ready? I chose the REGENCY TAPESTRY COVERLET from Soft Surroundings. I wanted to have a pattern in here with some soft color.Even though I have a neutral bedroom, the colors went very well. I know a lot of readers prefer color and pattern, and so I was thrilled to get an opportunity to show you a new look in my bedroom. I am a huge fan of the color duck-egg blue. This tapestry coverlet has a lot of duck egg blue in it. The soft blue works so well with my oatmeal linen fabric. There is a lot going on in the pattern, yet it doesn’t feel like it’s too much. There are several colors and you could pull out and add to your room, the yellow, the blue or even the burgundy, I added the duck egg blue pillow. 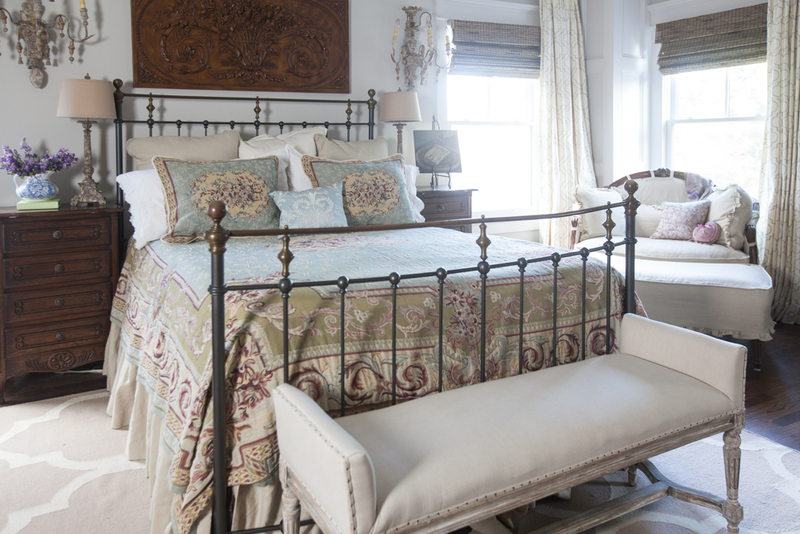 I love the elegance of the coverlet and think it would go well with a neutral room or one with color. I love how the sun pours in my bedroom during the day. It’s so cheery. 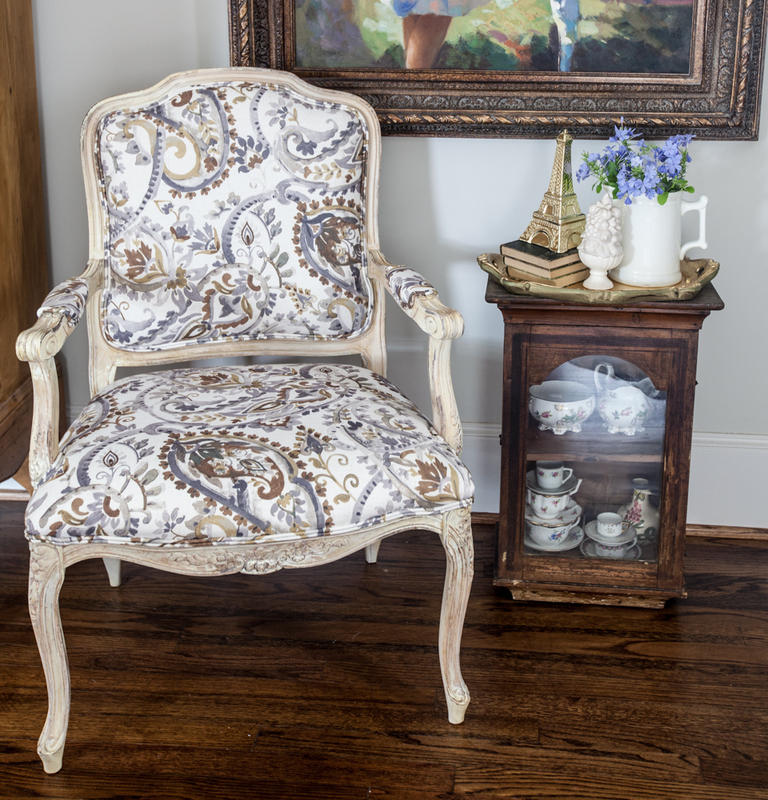 Now by the armoire, I added the fabulous Firenze armchair to the room. I think the scale works better in here, and there’s another reason I really love this chair. 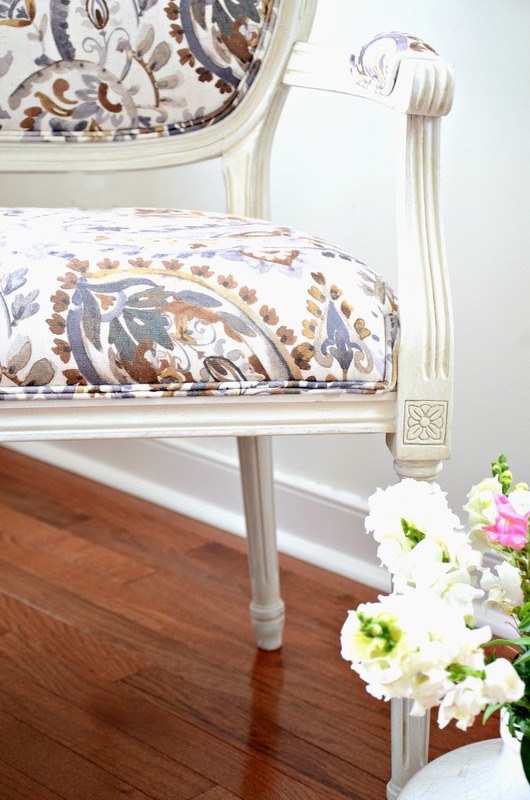 One of the reasons I often buy vintage is so that I can find chairs made in Italy or France. This chair is crafted in Italy, which is difficult to find in a new chair. It’s larger than the vintage ones which is another plus. I am loving this chair in my bedroom. Now the chair has a definite pattern, but is still fairly neutral. The colors are gray and tan, so it will work with a lot of different colors. It has so many luscious details including double welting. I don’t often take photos this direction in my bedroom, but here is how it looks. Yvonne doesn’t like to see fur in the summer, so Yvonne you might want to avert your eyes! I have some wall art I want to show you, but it’s in another room. This is the Rue de Bac Grille. It is made from mango wood, based on some grill work found in Provence. It looks great in our guest room, which is also my podcast studio. So what do you think? Do you like the new touches of color? 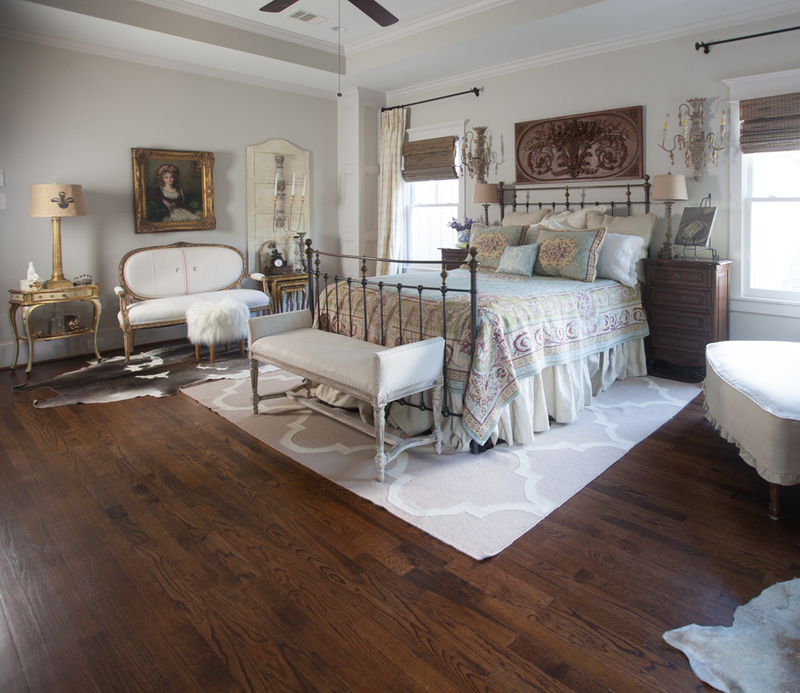 Be sure to check other blogs on this room refresh tour sponsored by Soft Surroundings. What color is the bedroom – what paint product? Great changes! I love Soft Surroundings products. I got my linen bedspread through them and it, like yours, totally changed the look of our bedroom. I love the addition of color! It’s mute tones add to the neutrals in your room. I do not, however, like the blue pillow. It is too much like the main color of the coverlet. I would rather see one of the other colors pulled out. 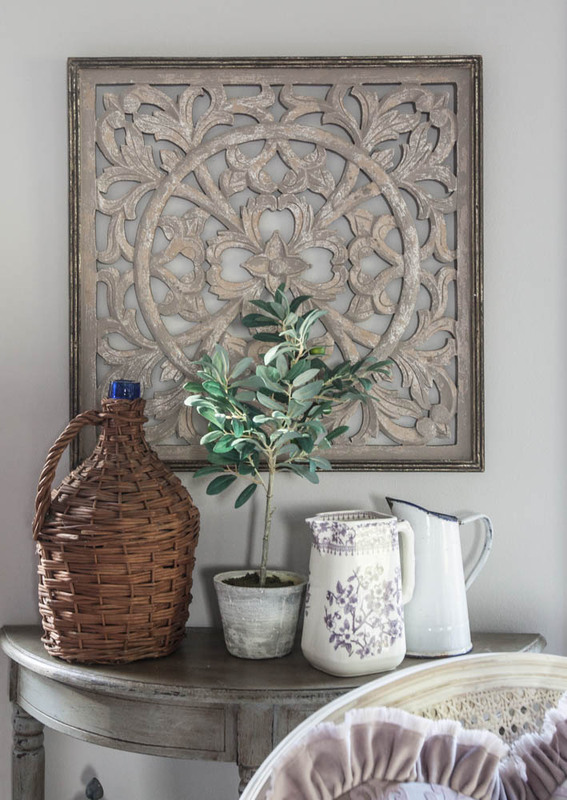 I also love the wall art grille, although I would much rather see it as a diamond shape on the wall rather than the ordinary square shape! It would draw more attention to it, and it deserves attention! I looked at the first pic and nearly fell out of my chair – not seeing that lovely bedding YOU made! I do love this bedding. So beautiful. Love the chair. Love the wall art. Lots of changes since I was there last. And, as always – it all looks AMAZING. 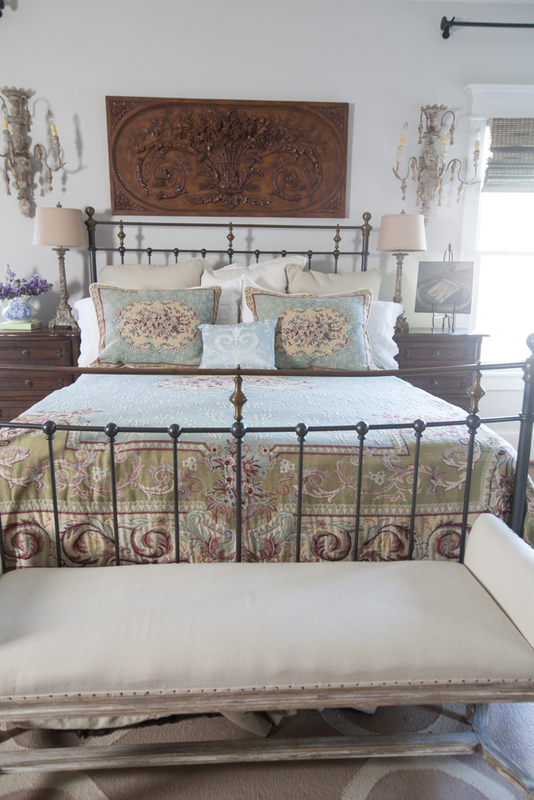 Always loved that gorgeous tapestry coverlet!….I am a definitely one who loves pops of color! The coverlet looks awesome and the chair looks great! It’s nice to change for a season. I love the new chair. I’m more of a neutral gal and I love robin egg blue. Your room is lovely and spacious. I like it a lot – all except for the animal hide rugs. I can’t see where they add any french infuence in this room. I too love the home items they sell at Soft Surroundings. In the summer I use one of their blue coverlets at the foot of my bed and the matching pillow shams. Very nice job! I was all prepared not to want any changes in your beautiful bedroom…but…I love the changes! Just the right amount of pretty, but muted colors. It actually enhances an already perfect look. Absolutely love the new look of the blue. It is so romantic and adds softness to the room. It makes the room pop. Love the framed picture of the girls – any idea where you bought it? Stunning Anita! 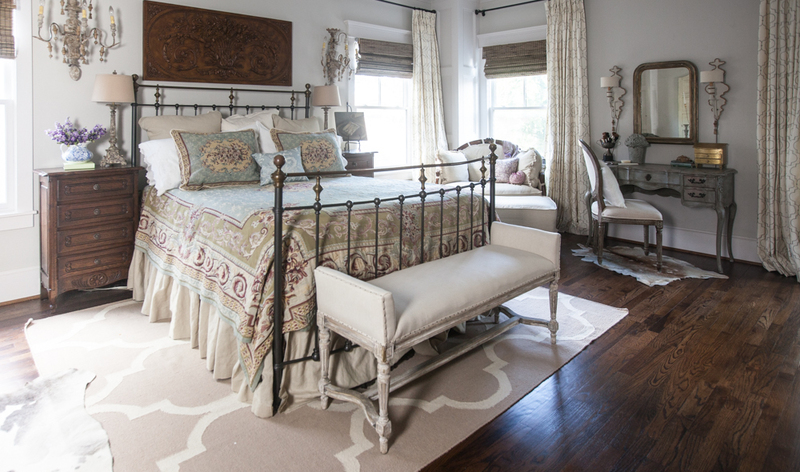 The coverlet really adds a dimension of depth and color to your room. Aren’t you so impressed with the beauty of Soft Surroundings? Love it! While neutrals are not my thing, they are for my husband. You have given me an alternative that suits us both. Thanks! I don’t normally comment on your blog but I have to on this one. I LOVE what you have done with your bedroom! I follow all of you “girls” because I’m craving a more neutral palate in my home and all of you are so talented!! ? 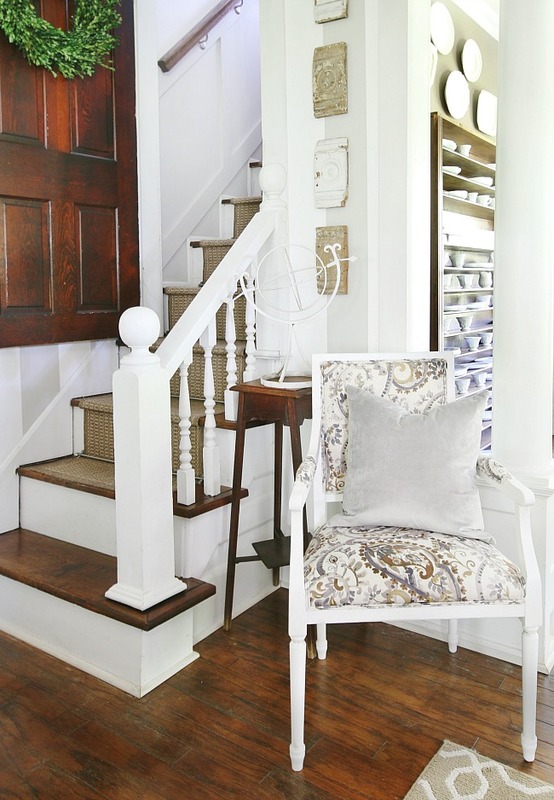 Personally I feel “neutrals” can go a little overboard leaving the room too stark, boring and just plain blaaaaa. This time you have added just enough color and texture for appeal to the eye without screaming color. Well done!!! Love the before and the after. Both gorgeous! I really like the color in the room. The chair is beautiful! You are such an Inspiration! I love the changes — they are perfect. I like the added color! I have two slighter smaller Italian made chairs that are very similar to yours. The needlework upholstery needs to be replaced. I was thinking something neutral but now I’m wondering if I’d like a print better! I love the colors, so soft and serene. I thought you might go a little wild but this is perfect. Your color changes are awesome. I’m a lady who loves color – pastel or bold. They just speak to me. So rock on Girl!! Yes, it is a lovely change? You are so fortunate to have such a lovely large bedroom! I love the new touches and could enjoy spending quality time there if it were mine. It seems tranquil to encourage personal peaceful moments. I do really love the new color introduced into the bedroom. 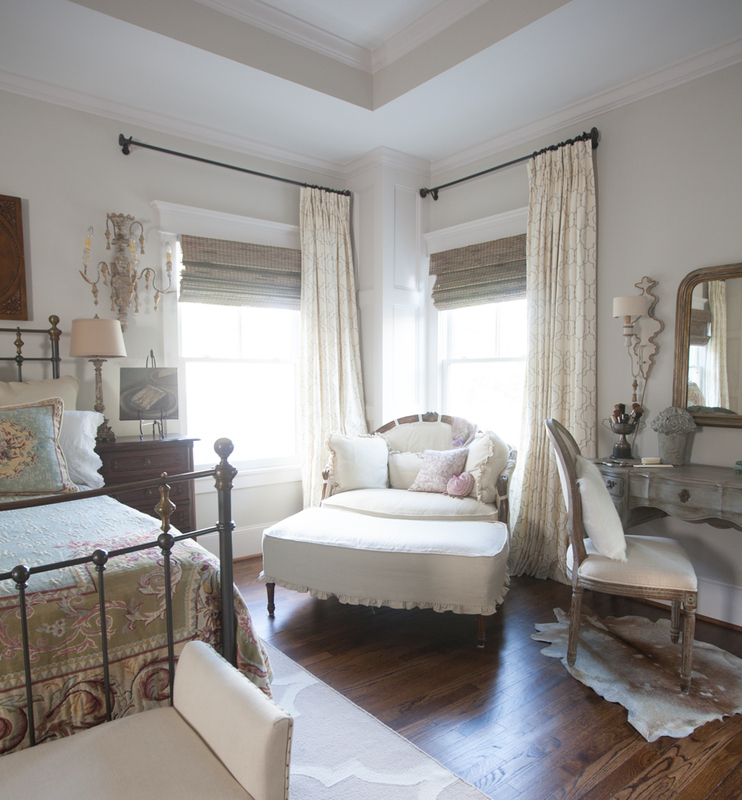 I have a question about your FAN in the guest room…-so cool (pun intended)–where did you find it? Love that! I like the philosophy that interior space/decorating really DOES matter and is not a trivial thing. I totally agree. Making a home comfortable and inviting, what a haven of peace! How could that be a triviality?? Thank you for your insights. I appreciate all of your efforts. Thanks for sharing! I am now inspired!! Love that bedroom and the softness of that blue. Reading the comments, I’m apparently the only one who doesn’t prefer the change. 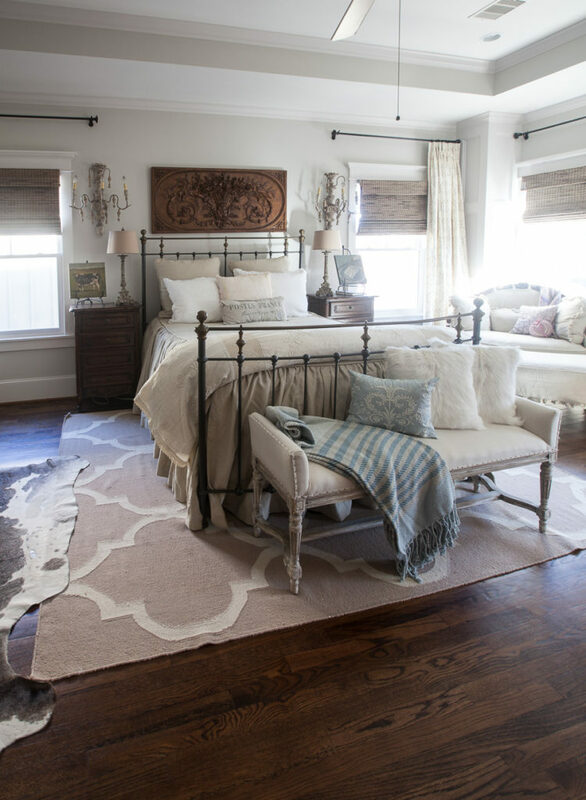 I love tone on tone in a bedroom. Something about the new items just looks “outdated” to me. I’m the only one so I must be he weird one. Lol. I agree with Nancy, as I liked the old look better . Both looks are lovely , but 2nd looked out dated . I love your before and after! So fun to have options. I am a huge fan of the hide rugs and your furry stool too! You really make this style your own! I love to have options too Jessica! I think it’s wonderful to be able to change out the bedding when you want to. Now I have two gorgeous options for the room. Anita, I agree with all those that loved the change. Having an option to change a few things for a season or 2 is wonderful! I am drooling over your wood floors and would appreciate any details such as type of wood, color and finish. They seem perfect! I love your decorating style. Both looks work. Sometimes you have to step out of your comfort zone and try a new look. I think the coverlet looks fabulous. I love both color schemes. Very pretty! But I find the pattern on the bed in the second photo, which is beautiful to look at, makes the space between both windows seem a bit crowded. Except for that it’s beautiful to look at! Just Beautiful!! Would you mind telling me the make and color and exact type of natural woven shade/blinds you have? I am enjoying your podcast so much! I started purging things yesterday!! I’m glad Christy asked, as I wanted to know that, too. I’ve only been following you for a short time. I think your bedroom looks lovely either way, and I’ve loved that coverlet for some time. I’m a Soft Surroundings junkie! Wow, you did a fabulous job here, I love everything! Might you know where I can get one of the lovely chair and ottoman you have in the corner of the room by the windows? I LOVE them! Jane that was discontinued some years back. It was made by Southern Furniture. I haven’t seen them any where else. Where did you get those curtains in bedroom. I tried clicking on your link to get info and nothing happens. They would great great on my space. Oh, I’m sorry Tracie. The curtains are from Bali Blinds.